The adidas bloxing gloves Speed 300 3D are ideal training partners for athletes, whose fight style stands for speed and explosiveness to knock out the opponent. 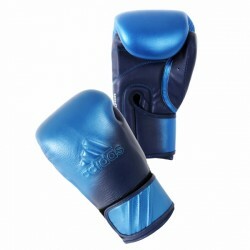 The material of the adidas bloxing gloves Speed 300 3D is made of very soft calfskin. Thus the glove adapts perfectly to your hands and gives an experience which never existed before. The processing of the adidas bloxing gloves Speed 300 3D made of several foam layers, which are adhered one above the other, gives the required safety to protect the hand optimally even for hardest punches. The precious colouring in blue metallic and the 3D logo on the back of the hand make the adidas bloxing gloves Speed 300 3D a real eyecatcher and complete the first-class quality of the glove perfectly.